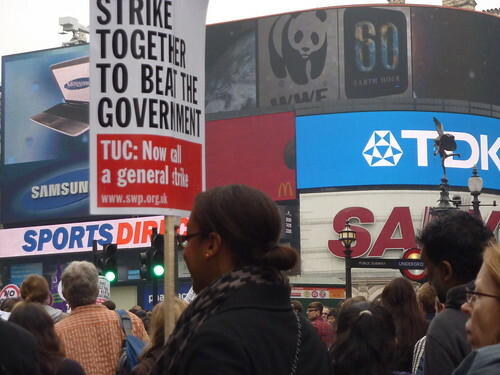 I’ve written about my background and my somewhat ambivalent relationship with Unison in the past but today, as there is to be a widespread strike in the UK, I almost wish we had also been called out to strike alongside the teachers and the civil servants. I’m very far from a ‘trigger happy’ union member. My default position has been to vote against any strikes called because I just want to get on with my job. Saying that, my attitude has changed over the last year or so since the election of this government and the dismantlement of the welfare state. The difference is that now, I’m angry. Yes, I have a ‘public sector’ pension so the issue that today’s strike is about does affect me directly. I think the amount of jealousy and petty spirited hate that has been stirred up by the current government against public sector workers is distasteful in the extreme. We are portrayed as ‘fat cats’ milking the State while we depend on the poor private sector to prop us up. Oh, I might have a ‘get out’ because I could be regarded (although who knows on what definition that go) as a ‘front line worker’ but I don’t want to be patted on the head and distinguished from those who work incredibly hard to make sure that the work I do ‘at the front line’ can be carried out. The administrative support, the IT support, the care workers (as we still have an in-house service) the emergency alarm cord operators, the library staff, the receptionists, the training department, the HR team and the accountants. I want to know who these ‘paper pushers’ are supposed to be as most of the paper pushing happens in the executive offices or in the Houses of Parliament. Over the last year, when we have had endless consultations about the cuts that are coming in our services and the changes that are coming to our jobs, I have seen the real value of union membership. As a member of Unison, I have attended regular meetings in our service and have gleaned a lot more information about the process than I would otherwise have had. We have been involved because the council has needed to involve us and yes, some of the shop stewards can be a bit bolshy, but that has been a very necessary characteristic in their dealing with the council. I do wonder if BASW’s idea of a Union of Social Workers would have the same fire and resources to fight so strongly on our behalf as local authority employees. At the moment, I am very happy with Unison and the way they have supported and informed us through these difficult times. As for today, good luck to those on strike. The issue they strike about today is also my issue but my anger is much broader than the pension issue – it is the destruction of support in society and the way that those who have least as being asked to pay. I have learnt more in the last year about the importance of union membership than I had in the previous ten. I don’t expect to ever follow blindly but I do value my membership much much more in these uncertain times. Yesterday, as a part of Lansley’s so-called ‘listening’ exercise, he found himself at the conference of the Royal College of Nursing (RCN) as they voted in favour of a motion of no confidence in him personally by a fairly substantial 99%. Rather marvellously when you take into account the 13 abstentions, only 6 nurses voted against the motion of no confidence. As was mentioned on Twitter yesterday, it seemed to be a miracle that 6 were to be found. You’d have thought that that was quite a strong message for Listening Lansley to have paid heed to but no, he wanted to give a perception of listening (as if the vote of no confidence wasn’t a strong enough message!). He asked for 60 specially chosen RCN representatives to talk to him while he ‘listened’ for 90 minutes in a room to which press were not allowed. Well, nothing wrong with listening of course. I shouldn’t scoff but I can’t help it amid Lansley’s gruff and graceless apologies. Why? Because the listening should have been done before the plans were announced. The listening should be done with a whole wide range of people who have an interest in the health service. He has got it wrong but he doesn’t seem to want to listen as much as try and persuade and regroup around his message of privatisation. The message from the Royal College of Nursing was strong, and powerful and it has caught the news media. People listen to nurses when they say things are wrong. But we can’t forget how wrong the government got when they brought these proposals to Parliament in the first place. What does it say about a government that has to do its consulting AFTER it has taken a Bill to Parliament that has been so strongly attacked on all sides by public and professional opinion. It doesn’t exactly make one comfortable that we are ‘in safe hands’ as they like to promise at election time. Maybe it’s because all the consultations they did before the Bill was presented were with private companies and party donors. This is a government which is struggling under the surface and has been caught out already on many occasions by acting without any idea of what the plans that they propose actually signify. It is when they try messing around with the health service that people sit up and shout back but what about the other measures that they have proposed like the changes in the welfare benefit systems which seem force degrading and inappropriate ‘tests’ to claimants to jump through hoops to get the money they ‘deserve’. This is what we need to speak up against as well. And one of my sadder moments yesterday, when I thought about the impact of the nurses and the fact that they are at least being listened to for press purposes, is how we, in social work, have been poorly served by the organisations that supposedly represent our interests. We should look at the RCN and what they have done and the effect a vote of confidence had on the ridiculousness of Lansley’s ‘listening’ exercise when with an almost unanimous voice they have humiliated him. Where is the nearest equivalent social work voice? Community Care reports that the Chief Executive claiming that ‘he simply doesn’t believe’ Unison’s figures of having 40,000 social work members. Honestly, is that the best he can do in rousing his members? Is that the best we can do as social workers when we should be at the heart of opposing the government agenda to heap the cuts on those who have the least? We just get into squabbles between Unison and BASW about who has the most social work members? Who is going to ‘lead’ the College of Social Work? Are we going to have a ‘Chief Social Worker’? Surely better to have a broad members organisation that can speak for all social workers rather than split members into different ‘camps’. As for me, I’m a member of Unison AND a member of BASW. Generally, I’ve seen value in both. It isn’t about a competition about who has more members and some people like me would be counted twice in the figures. More than anything we can see the importance of having a strong, national voice as a profession and as representatives of a social care sector that is being and has been ravaged by repeated governments. Perhaps a broader College of Social Care might not have been a bad idea. The stronger the body the louder the voice. Of course, that isn’t going to happen. It looks like we will be left with a College that few social workers who are on the front line will be interested in because we don’t have time for the politics within the profession. We have too much to do and need to focus on the politics of the country before everything that we know and love about this society is lost. So while the College or Colleges (depending) spend all their time and money rewriting competencies or capabilities or capacities again and again and again ad infinitum – some of us will just be getting on with doing the actual work. But the shame of it is that a College of Social Work/Social Care could perhaps have been a voice to shout against the Welfare Benefit Bill and the ridiculous tests that are put in place to make decisions as to ‘eligibility’ in the same way that the nurses are a voice to shout against the health and (oh the irony) social care bill. We should be more like the nurses. We need to be if we are to survive and have relevancy. We need to be listened to as well. But in order to be listened to, we need to build support up amongst ourselves rather than squabble like schoolchildren. That is the pity.